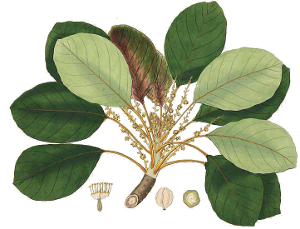 The various types myrobalan are dried fruit from a variety of trees of the genus Terminalia. Spice of Life uses two types of myroballan in combination with the spice amla to produce triphala. Chubelic Myrobalan generally benefits the digestive system. It is used as a safe and effictive laxative as well as a remedy for diarrhea and dysentery.